Which agent characteristics are most helpful to the business and how should these be rewarded? Motivating and keeping good agents in a working environment that is often stressful, sometimes repetitive and usually not particularly well-paid is a challenge the contact centres have had to face since their inception. 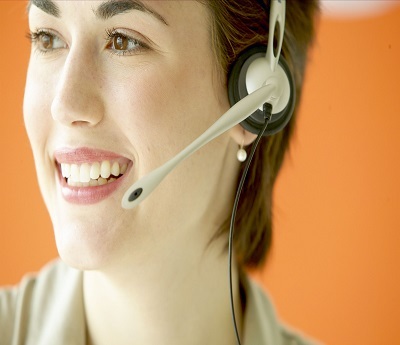 As the nature of contact centre work becomes increasingly complex, and customers’ expectations of what constitutes good quality service becomes ever higher, the agent’s job rarely just involves reading something off the screen: they have to be empathetic to the customer, use their initiative to solve the issue and remain focused on answering the next call just as effectively. As the success of the contact centre is no longer simply about managing call volumes, it’s important to understand which agent characteristics and achievements are most helpful to the business to encourage and reward. For a recent ContactBabel report (The 2015 UK Contact Centre Decision-Makers’ Guide), contact centre managers and directors were asked to choose which, from a list of seven characteristics and targets, were the top three that they would most like to encourage in their agents. 53% of respondents stated that they would most like agents to achieve higher customer satisfaction and feedback scores, with a further 18% saying that improving sales and conversion rates was most important to them. 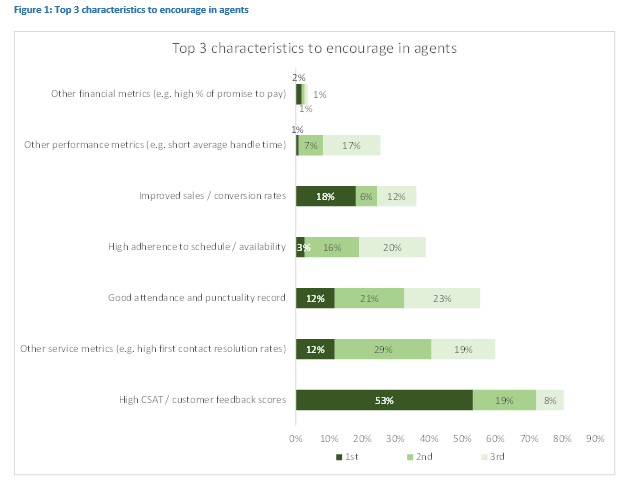 Agent attendance and punctuality records featured as a top three choice of 56% of respondents – 80% put high CSAT scores in their top three – and half of respondents stated that other service metrics (such as an improvement in agents’ first contact resolution rates) was a top three priority for them. 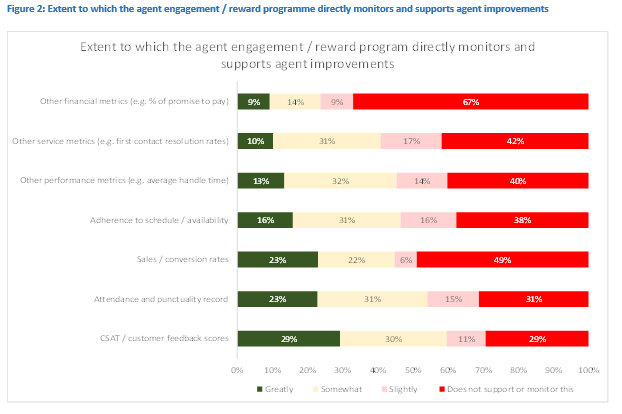 Bearing these findings in mind, we could expect that the agent engagement/reward programme supported the characteristics and achievements that are most highly valued by contact centres: specifically customer satisfaction, attendance and punctuality, and customer service-focused metrics such as first contact resolution rates. 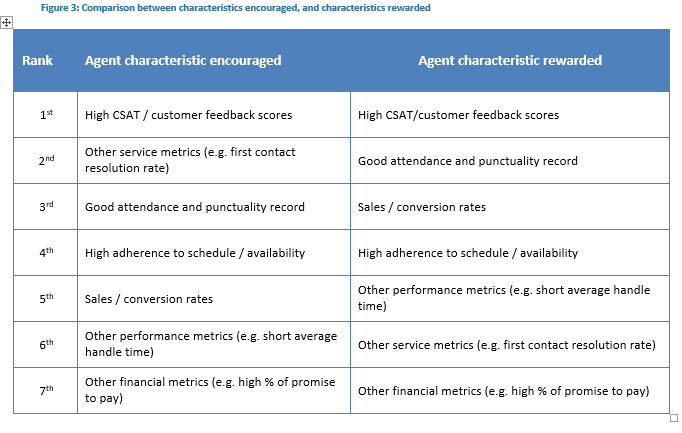 While the agent engagement/reward programme is said to monitor attendance and punctuality records and customer satisfaction scores either ‘greatly’ or ‘somewhat’ in more than half of cases, traditional operational performance metrics such as average handle time feature more frequently than service-based metrics such as first contact resolution rate, despite respondents’ insistence that the latter matters far more than the former. As first contact resolution is reported as the metric most affecting customer satisfaction, this could create a gap between what is required and what is actually rewarded. For 42% of respondents to say that vital customer-focused service statistics such as first contact resolution rate do not play a part in rewarding agents is dangerous, particularly when considering that operational performance metrics such as handle time are more likely to be taken into account, despite not aligning with businesses’ own stated requirements of the characteristics and targets that agents should have or achieve. The following table shows this more clearly. The agent characteristics and achievements that are encouraged and required are shown, in order of importance, on the left. The characteristics and achievements upon which rewards are actually based, are placed on the right. It would be expected that the most encouraged and desired characteristic would also be the most important when considering how to reward agents: in this way agents would be rewarded based upon how much their performance and behaviour aligned with the needs of the contact centre and the business. High customer satisfaction scores are stated to be the most important, and are said to be rewarded the most often, which is as it should be, and although the characteristics do not quite match up exactly, there is one element that stands out. The greatest discrepancy, and one that is cause for worry, is that customer-focused service metrics such as first contact resolution rates are seen as being the 2nd most important characteristic to be encouraged, but only rated as the 6th most important characteristic to be actually rewarded, putting this out of alignment with what the contact centre and business itself deem necessary for success. While measuring first contact resolution is a difficult task, these findings suggest that the industry as a whole should strongly consider whether it is truly rewarding agents for doing the right things for the customer.